Plan, Plan, Plan – There are so many party planning websites and apps for your smartphone that will get you moving on your way to planning paradise! Anything that you can do in advance will also help you keep your cool throughout the event. Make sure there is extra toilet paper in the rest rooms, serve punch in large serving containers and create a drink/bar area that people can help themselves at, so you aren’t playing cocktail waitress all night. By taking your time beforehand and making sure you have all of your i’s dotted and t’s crossed, you are going to make the day of your event much less stressful. And what does that mean? You get to have FUN! Email Your Invites – Oh, I know… it can be less personal, but if you’re hosting a more informal event with close friends or family, sending out your invite over email will save you a lot of time and money. And most likely, the guests won’t even care! They are more excited about the upcoming event, not what kind of invite they received. More formal events may still call for mailed invitations, so use your discretion. But if you are able to email your invites out, you’ll find things less stressful with more time to plan for the actual party that is coming up! Let Guests Help – Extra hands can make all of the difference when trying to prepare for a dinner party, birthday, or whatever else you may be hosting. Times are few and far between when someone doesn’t offer “what can I do to help” when they arrive, or even beforehand. Don’t feel guilty taking them up on their kind generosity and stop feeling like you need to do everything yourself in order to make your event a success! We all can be martyrs too many times. Can’t think of something that someone could help with? Even something as simple as sticking a camera in someone’s hand to make sure you “capture” the entire event takes a big weight off your shoulders! Or, when you’re thinking of how to answer when a guests asks how they can help beforehand, consider letting them bring a dish to pass. Maybe they make THE BEST GUAC and you would love for them to share it. Or maybe you have a friend who is the most talented person you know when it comes to creating place cards. Ask them if they’d mind creating place cards for your dinner party! If you have everything set for the menu and you are comfortable with all of your activities and decor, ask everyone to bring their own drink of choice along. Why not make sure everyone loves the wines, beers, and drinks you will have available by having them bring their own! Of course, you could supply water bottles or children’s drinks. What a relief to have a few things knocked off of your to-do list! Cater In – If cooking and menu planning just isn’t your thing, think about catering in the event. Find a favorite local restaurant that may be able to handle the dinner party you are hosting and let someone else stress over the details! Even if you cater in a few things, your life will be so much easier at your event. Want to make that favorite dessert of yours? Than cater in the main course! Have something specific you’ve been dying to have for months? Cater in the appetizers and dessert! No matter the plans you have in your head for the menu, you will be sure to enjoy yourself more at your event if you aren’t overwhelmed with menu and food dilemmas! Overwhelmed With Cleaning? Hire Help! – On the other hand, if cleaning is just not your forte, that’s OK, too! Hire a cleaning company to come in and do a once-over in your home before your big event. Or, if you don’t mind taking the time to get everything ready, hire a cleaning company to come in after the big day and clean up so you can relax and bask in the afterglow of party success! Enjoy the time with your guests and decide what may work best for you when it comes to hiring outside help. Let Go Of Perfection – We all want to throw the perfect party. Why would you settle for anything less? But there comes a time when you’re going to have to let go of absolutely everything you want, or you are going to drive yourself crazy and cause unneeded stress. Who needs that? So maybe you run out of a specific appetizer earlier than you expected. Or maybe you forget to offer a gluten-free version of an item for your Aunt Edna. Or maybe you forgot your best friend’s husband favorite drink. That being said, as long as you planned everything beforehand, you should have plenty of other options for everyone to choose from that will keep the party going! Nothing is perfect, so don’t expect your party to be, either! Serve Food Family or Buffet Style – Don’t want to worry about fancy place settings and want to keep it simple and easygoing during your party? Serve your food buffet style so everyone can run through the line and grab what they’d like. This makes it so much easier during parties for you to focus on the fun things going on around you, versus having to worry about serving all of your guests during your party. Many times, people prefer to pick and choose what they’re going to eat, anyways, so why not make it easier for everyone by allowing them the option of things they will take. Easy peasy! Plan a Menu and Activities that you Enjoy – One great way to make sure you’re going to have fun at your own party is to create a menu and plan activities that you absolutely love! Who wants to throw a party that doesn’t reflect their true, authentic self? We all spend so much time worrying that our party won’t be everything our guests wanted it to be, but what happens when it’s not the party WE wanted it to be? Stop catering to everyone around you and make sure your menu is full of items you can’t wait to dig into. Who doesn’t love a party where everything there is their favorite?! Simplify – Don’t be tempted to create difficult menus! That being said, if that’s your forte and you are the cooking queen, by all means, knock yourself out! But for many of us, one of the most stressful elements of a party is deciding on the food you are going to serve and how you are going to serve it, so make sure you keep things as simple as possible. Or, ask for outside help! Also, make sure you keep the guest list minimal. If you can’t accommodate all of the guests you invite, it’s going to end up being difficult to have fun because you’re going to be worried that everyone is having a horrible time! Know the space where you are going to be hosting your event and make sure that the invite list is going to be a comfortable fit. Also, work on making as many things ahead of time as possible. That keeps the day of the party simple and it will make sure you have plenty of time for any last-minute items that may pop up! Prepare Your Home Ahead of Time – Make sure there are comfortable areas for guests to chat, sit, and eat. Double check that you have extras out that may be needed, like pillows or blankets (especially if you’re hosting things outside!). Make sure you have plenty of garbage receptacles available for everyone and make sure the rest rooms are stocked with items that may be needed. 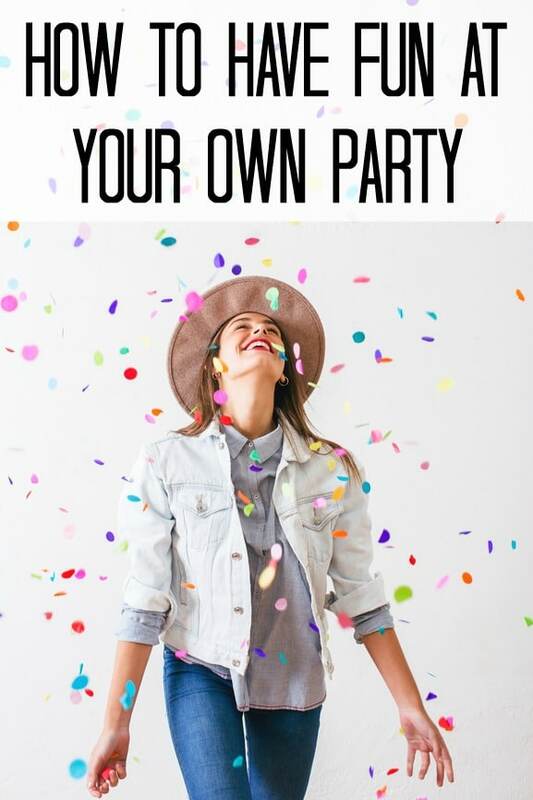 By making sure you have all of your preparations done ahead of time, you’re going to be able to relax and know that you are ready to have fun at your own party! How do you have fun at your own party? Let us know your tips in the comments below! Here are some entertaining must-haves that we can’t live without! Check out these awesome party features on Pretty My Party!